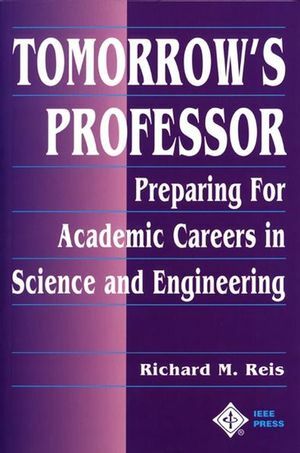 Tomorrow's Professor is designed to help you prepare for, find, and succeed at academic careers in science and engineering. It looks at the full range of North American four-year academic institutions while featuring 30 vignettes and more than 50 individual stories that bring to life the principles and strategies outlined in the book. At a time when anxiety about academic career opportunities for Ph.D.s in these field is at an all-time high, Tomorrow's Professor provides a much-needed practical approach to career development. Richard M. Reis is the Executive Director of the Stanford Integrated Manufacturing Association and the Associate Director for Global Learning Partnerships in the Stanford University Learning Laboratory. Dr. Reis is also a consulting professor in both the Stanford University Electrical Engineering and Mechanical Engineering Departments. Among his many responsibilities is the teaching of a year-round seminar on preparing graduate students for academic careers in science, engineering, and business.